Did comment flags just change? I don't see "Too chatty" or "Not constructive" any more. Is this a new thing, or did I just lose my ability to use those for some reason? 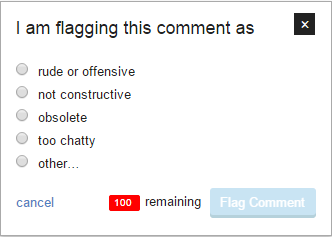 Yes, there has been an open feature on MSE to change the comment flag categories for some time. It was implemented today. The first flag replaces the former "rude or offensive" flag; the last replaces "other". The middle flag - "no longer needed" - is new, and is intended to cover both "too chatty" and the non-abusive uses of "not constructive". Please report any bugs here on meta, and blame Adam for pushing on a Friday afternoon. Not the answer you're looking for? Browse other questions tagged support comments comment-flags . What is the preferred flag for “Thanks for your answer” comments? How should I handle unfunny, frivolous comments? Is this tangential discussion in the comments too chatty (declined flags)? Did comment flags just change again? 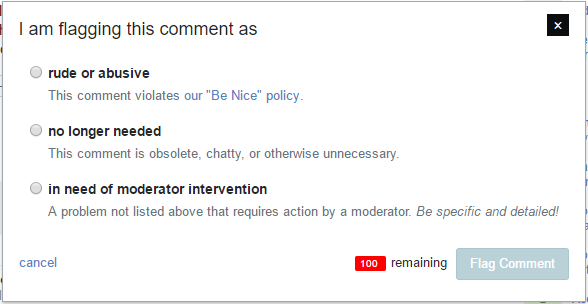 Did my comment just disappear?